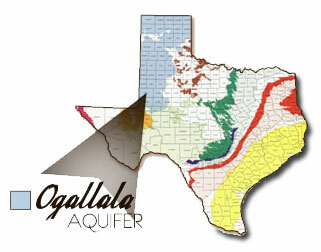 The Ogallala Aquifer is the primary source of groundwater in the District (Fig. 2). Saturated sections range from less than 10 feet to more than 130 feet in the area covered by the District. The formation consists of heterogeneous sequences of clay, silt, sand and gravel. These sediments are thought to have been deposited by eastward flowing aggrading streams that filled and buried valleys eroded into pre-Ogallala rocks. A resistant layer of calcium carbonate-cemented caliche known locally as the “caprock” occurs near the surface of much of the area (Ashworth and Hopkins, 1995). Water levels in the Ogallala Aquifer are primarily influenced by the rate of recharge to and discharge from the aquifer. Recharge to the aquifer occurs primarily by infiltration of precipitation falling on the surface. To a lesser extent, recharge may also occur by upward leakage from underlying Cretaceous units that, in places, have a higher potentiometric surface than the Ogallala. Generally, only a small percentage of water from precipitation actually reaches the water table due to a combination of limited annual precipitation (15.8 inches per year), high evaporation rate (60 – 70 inches per year), and slow infiltration rate. Groundwater in the aquifer generally flows from northwest to southeast, normally at right angles to water level contours. Velocities of less than one foot per day are typical, but higher velocities may occur along filled erosional valleys where coarser grained deposits have greater permeabilities. Discharge from the Ogallala aquifer within the District occurs through the pumping of wells; primarily irrigation wells. Groundwater pumpage typically exceeds recharge and results in water-level declines (Ashworth and Hopkins, 1995). The chemical quality of Ogallala groundwater varies greatly across the District. Electrical conductance (EC) varies from less than 1.0 dS/m to over 4.0 dS/m. Generally, groundwater in the eastern and southeastern parts of the District exhibit the highest EC. Isolated occurrence of high EC values elsewhere in the District may be due to pollution through oil field salt water disposal pits or upward leakage and mixing from the underlying Cretaceous aquifer. The suitability of groundwater for irrigation purposes is largely dependent on the chemical composition of the water and is determined primarily by the total concentration of soluble salts. Some farm acreage in the District is already limited to certain varieties of salt tolerant crops due to limiting or damaging total salt levels.